Hole twelve is a par 5 with a dramatic dog leg that requires an accurate tee shot if you want to reach this green in regulation. Thick trees line both sides of the hole off the tee. With a good tee shot, the second shot requires you to carry a creek to a generous fairway that reveals a challenging green. Par or under is a very good result on this hole. Safe Play: Layup safely to the heart of the fairway with a long iron. When playing your second shot over the water, take another long iron and hit short of the large fairway bunker this will leave you a short iron or wedge into a very large and open green. Aggressive Play: Hit your tee shot as close as you can to the corner before the water, setting you up for a chance to go for the green with your second shot. 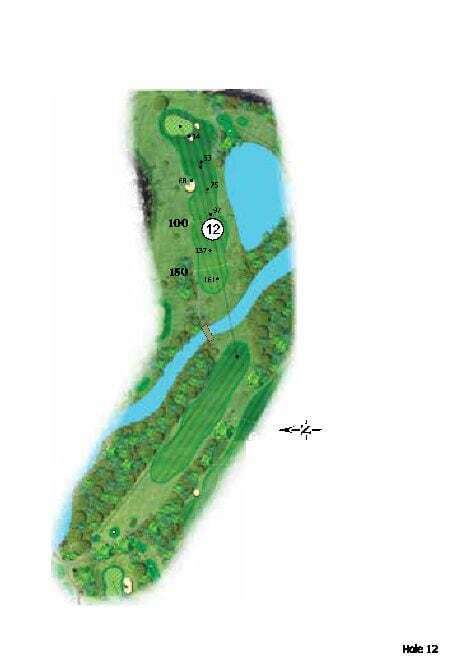 Aim straight at the green and hit your 3 wood over the fairway bunker to set up a birdie chance on this long par 5.